After talking last time about what to do with a mold problem, it seemed logical to address a related problem - the wet book. 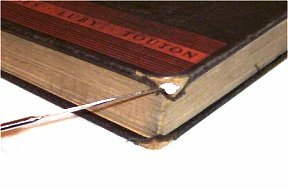 Many of us have had the experience of an unexpected leak or spill resulting in a book getting wet. If you can catch the problem immediately-before the book soaks up too much water and swells, or before it dries on its own and becomes a book brick-your chances for saving it are good. Keep in mind, however, that no method of drying will restore the book to its original condition. Even after it's dry, a book might remain as much as 20% thicker due to permanent swelling of its paper's fibers. Do remember that wet paper is very fragile. Handle a wet book carefully, using both hands to support it when moving it. Work in an area that is dry and cool and has lots of air circulation. It might seem obvious that you shouldn't use a regular oven, a microwave oven, or a hair dryer to dry a book, but I can tell you that it's been tried and the results weren't pretty. Air drying is the method that most people can use without having to obtain expensive equipment. The goal is to allow the book to dry slowly. The process is rather time- and work-intensive, but if it's a book worth saving, it'll be time well spent. The following steps should be used only with books that have standard (bond) paper pages, not with books with clay-coated (slick) pages. First, interleave the pages with unprinted paper towels, blotter paper, or blank newsprint. If your town has a local newspaper, many times you can obtain substantial remnants on rolls for free. Do not use printed newspaper because the ink will come off and stain your book's pages. If most of the book is wet, you will have to do the interleaving in stages, a few sections at a time, to avoid adding too many sheets of paper at one time and damaging the book's binding. During the interleaving process, the book can be laid flat or leaned against a bookend. But what if you can't attend to the wet book immediately? In this case you can loosely wrap the book in wax paper or freezer paper and place it in the freezer compartment of your home refrigerator. Lay it flat and weight it with a brick to help the book keep its shape. Freezing not only will prevent the formation of mold but it will halt the bleeding of dyes and inks and reduce the physical distortion caused by the paper fibers reacting to the water. When you are ready to work on it, you can thaw it out and begin interleaving the pages. If the book was more than a little wet, you will need to regularly - every hour or so - replace the original blotting paper with dry sheets. If you cannot interleave and absorb the excess moisture from all sections during the course of a day, return the book to the freezer overnight because mold spores will begin to grow within 24-48 hours, exacerbating the problem. When you've removed as much excess water as possible and the book is still cool to the touch, remove all the interleaved paper and gently fan the pages. You may wish to stand it on its edge and allow a fan to blow gently against it. When dry, lay it flat and put a weight on it in order to press it back into as much of its original condition as possible. Check it periodically for mold growth and remove any that you find immediately by swabbing it lightly with alcohol. The process for books with slick (clay-coated) pages, such as coffee table or art books is similar, but if you use paper towels, newsprint or blotter paper, the smooth, shiny pages of the book will stick to them. In order to avoid this, use pieces of wax paper rather than absorbent paper between each page in the drying process and keep the air circulating. Be prepared for a longer drying time because the moisture will have to evaporate naturally. Books can also be dried entirely in the freezer, but the process can take months and you must have a freezer that can work quickly and be maintained between -10 and -40 degrees F. Most home freezers are inadequate for the job. If contemplating the book-drying process was enough to make you chuck your wet book into the nearest trash can, here are a few easy fixes for books in your collection that need less attention and will result in books that will be more attractive to the potential buyer. What you'll need: microspatula, PVA glue, four small clamps (available cheaply at most office supply stores), eight small pieces of book board (roughly 1" square) and wax paper. 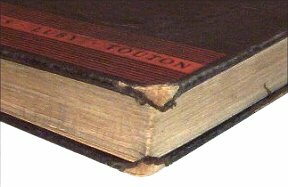 Many older books not only have bumped corners, but the cloth has completely worn off and the boards have begun to fray. Using your microspatula, gently fan the layers of the exposed boards. Dip the pointed end of the spatula into a small amount of PVA glue and work it into the layers. Pinch lightly with your fingers to remove any excess glue and to press the layers together. 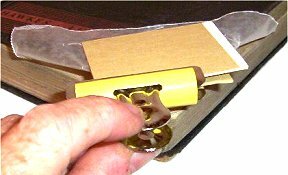 Wrap the corner with a small piece of wax paper, put one square of board on each side, then hold the "sandwich" together with a clamp. Do not use the clamps without the boards because you will dent the cover. Repeat for the other three corners. PVA dries quickly and you should be able to remove the clamps, boards and wax paper in about 30 minutes. If you don't have pieces of book board, anything hard and flat will work. In fact, I've gotten rid of old credit cards by cutting them in half and using them in place of board. If you're interested in making the corners even better, you can try touching up the gray board with a light dab of acrylic paint in the same color as the cover. If the cover is an odd color, matching it may be too tricky, but the technique certainly works for books in black, dark blue, and other standard colors. How many book descriptions contain the line "cover soiled?" And if you were a customer, wouldn't you prefer a book if the cover was as clean as possible? Sometimes the only thing a book needs is to have its cover spruced up a bit in order for it to become attractive to a customer. 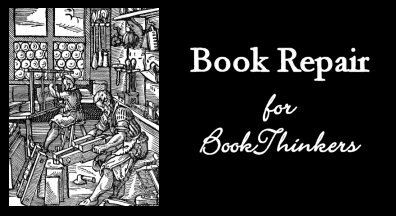 Here are a few products I've used that work really well in removing grime and improving a book's appearance. First, stray marks or penciled in notes usually can be removed and many of you may have used the standard gum eraser to do so. However, you might want to try the new vinyl eraser. It's softer, removes marks cleaner and is less likely to leave any crumbs behind. Most art or craft stores have them for a dollar. Absorene makes a book cleaner that comes in a 15 oz tub and looks a lot like your child's pink Playdoh. You simply take a piece, knead it a moment to get it nice and soft, then wipe the surface of your book lightly in one direction. After 5 or 6 strokes, you can reshape the cleaner and continue. Any small crumbs left behind can be easily wiped off. The pinkness quickly turns to gray as the dirt is collected. This bookseller's "Playdoh" can be used on a wide variety of other things as well: documents, older non-laminated dust jackets, paintings, bricks, wallpaper, ceiling tiles, lampshades - you name it! (Sterling makes a similar product called "Magic Book Cleaner" but it costs twice as much as Absorene.) Absorene also makes a handy dirt eraser that looks like a beige sponge and, like the dough, removes dirt, dust, smoke and soot. It's handy for use on book covers and newer jackets (ones with a laminate coating), but not quite as versatile for booksellers because it can be too rough for paper. Like the dough, it works well on tougher surfaces around the house such as vinyl, leather, or canvas. Cloth books often can be restored to their original supple feel and color with a handy product made by Starkey called "Clean Cover Gel." Simply apply a small amount of the gel to the cover with a clean, lint-free cloth and let dry. The gel usually can be used safely on leather, leatherette or fine-weave cloth but is not recommended for very old or rare books. None of these products are terribly expensive, and a little goes a long way. The Absorene dough is roughly $7.50, while the eraser is $3.00. The cover gel costs $3.50 for a 4-oz bottle or $11 for a quart. Finally, let me say a few words on "sticky stuff." Even if you avoid buying ex-library books, many times you'll find a wonderful book at a garage or estate sale only to find the seller decided it would be a good idea to put a sticky label on the book's cover. If it's been there for any time at all, it'll usually leave behind a residue that's hard to remove. Over the years, lighter fluid has been used with good results. But there are other alternatives you might want to consider. Two of these are liquids: Un-Du and Goo Gone. Both work well on a variety of adhesives, gum, grease, tar and other sticky problems (though must be used with good ventilation), but each has advantages. Un-du comes with a gentle scraper attached to its cap that is handy for getting rid of stubborn stickers. On the other hand, orange-scented Goo Gone smells nicer and it's much cheaper than Un-du. The latter costs $4 for 4 oz but Goo Gone can be had at Wal-Mart in a 16 oz bottle for the same cost. The third sticker residue remover is actually an eraser made by Xyron that costs about a dollar. It resembles the crepe soles of some shoes and works well on any surface that isn't too delicate such as cloth or paper book covers and laminate dust jackets. When it loses its ability to remove adhesives, simply cut off the worn part and expose a fresh edge. Arming yourself with a few inexpensive products and applying a little elbow grease can transform a good book collection into a great book collection that may just attract a few more customers.